Pescadero Creek County Park is a hiker’s paradise minus the hikers. Backpacking: $10 per night; sites at Tarwater Flat and Shaw Flat camps are available first-come, first-serve at the ranger station at nearby Memorial Park. Call (650) 879-0238 for more information. Driving directions: Hoffman Creek trail head: From Interstate 280, take Highway 84 west 13 miles through La Honda; turn left on Pescadero Road and go 4.4 miles to Wurr Road, turn left; parking lot is about 100 yards ahead on the left. Tarwater Loop trail head: From I-280, take Page Mill Road 8.6 miles to Highway 35, cross the road and continue on Alpine Road for 3.8 miles. Turn left onto Camp Pomponio Road (there’s a park sign on the left), follow it to parking lot. On the Web: San Mateo County parks department’s Pescadero Creek County Park page. Tucked into a remote section of the Santa Cruz Mountains south of La Honda, the park is one of three grouped nearby. The other two – Sam McDonald County Park and Memorial County Park – have far more amenities (car-camping sites, restrooms, etc.) but don’t have Pescadero Creek’s trails. Situated deep in the boonies, Pescadero Creek’s two trail heads have zero creature comforts, which probably explains the dearth of hikers. Still, hardy trekkers could hardly ask for a better setting: Well-marked, nicely graded trails zigzag through a redwood forest making a remarkable recovery from the logging era. Add it to your must-hike list. Standard precautions: Watch for poison oak along narrow trails. Dress in layers, as it can be quite cool in the redwoods and hot in sunny areas. The park may close when fire risk is high; call (650) 879-0238 before you go. There are jail facilities deep within the park, but signs direct hikers to keep a safe distance. Easy: From the Hoffman Creek trail head, take the Old Haul Road for just under a mile, turn left at the Pomponio Trail, follow it to Pescadero Creek and return for a pleasant two-mile stroll. 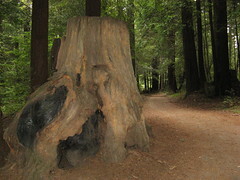 Moderate: Canyon Trail’s ancient and newborn redwoods are a must-see. From the Tarwater trail head parking lot, cross Camp Pomponio Road, and take the Tarwater Loop Trail to the east end of Canyon Trail. Hiking all of Canyon Trail is a 7.8-mile out-and-back; turn back sooner if that’s beyond your range. Hard: From the Hoffman Creek trail head, an excellent 12-mile loop on the Pomponio, Brook, Bear Ridge, Canyon and Tarwater Loop trails samples all the park has to offer. My first hike at Pescadero | My second. A weekly Walker hike at Pescadero. San Mateo County Parks page. Virtual Parks shaded relief map. ($1 to download; worth every penny). Redwood Hikes Pescadero Creek hike. Google Map for Pescadero Creek County Park. Hoffman Creek Trail Head is on the left, Tarwater Loop is on the right. This sounds wonderful. I am going to suggest it to my meetup! I left from the Hoffman Creek trailhead, Old Haul Rd. Turned onto Pomponio trail and came to the creek with no crossing and decided not to wade the thigh deep water. Backtracked to Old Haul Road, walked southeast to the Bridge trail and then picked up the Pomponio trail going back the other day. Awesome day. Very remote, isolated. Saw only one other hiker the entire day… at the creek crossing. Yep, after passing through Worley Flat, I ran into the same creek again, duh, from the other direction. This time, rather than turn around, I waded across it and sloshed my way about 1 mile and something back to my car. Get a good map, and slather on the baby oil and bugoff (DEET). The trails are often narrow and there’s lots of poison oak. It is very quiet.